Sorry if its been posted already, but Cadillac released an interior shot of the new Escalade. I'm pretty impressed. Far more premium than the past three generations. 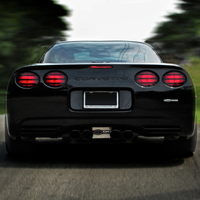 Will the Corvette Receive Round Tails? Am I doing something wrong, or is Tinychat messed up? It just sits there trying to reconnect. Is anyone in there to begin with? I'm bored and thought I'd stop in. Whats the deal with the Ducks? The other day I plasti dipped a friends wheels black and added glossifier. I've never used the glossifier until now, but I have to say I'm very impressed with the results. What say you oppo, is glossifier good or bad? I'm looking forward to the video that is certainly on the way of Jay Leno taking us around the Elmiraj. Pardon me while I pick my jaw off the floor. So much want!!!! New vision of luxury you say? This Thursday you say? Cadillac posted this little image to FB earlier to hint at the future LTS maybe? Whatever is coming I'm excited, I love Cadillac concepts. Am I doin' in Right? This weekend I randomly decided to plastidip my Blazer's chrome bits and wheels black. I think it came out pretty well, but I don't know if its actually an improvement over the chrome look, but I only have $8 invested, most of my 'dip was from leftovers from friends/family. What do you think? Good or bad?